Located on the island of Mandhata, next to the banks of Narmada River, Omkareshwar is a famous pilgrimage centre that that includes one of the 12 idolized Jyotirlinga shrines of Shiva. 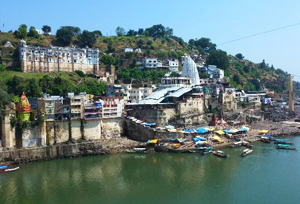 The name Omkareshwar means 'Lord of Omkaara', which is one of the Dwadasa Jyotirlinga shrines or the 12 shrines dedicated to lord Shiva in the form of a Jyotirlingam. It's a sacred island which is shaped like the Hindu symbols 'OM', drawing millions of travellers from all across the globe. It has two ancient shrines including Omkareshwar and Amarkareshwar. This holy place is located on the meeting point of Narmada and Kaveri River, making a must-visit pilgrimage destination for Lord Shiva devotees and leisure travellers alike. Set in the Khandwa district of Madhya Pradesh, Omkareshwar is forged by the sacred Narmada River. 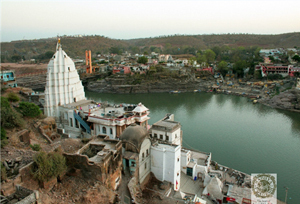 Built in the Nagara style, the Omkareshwar temple is featured by an eminent Shikhara. As per the myth, when Narad, the great prophet visited to the god of Vindhya Mountains, he was quite raging after knowing that there was no dwelling for Lord Shiva and so, the god of these mountains referred himself to very strict nonindulgences. Lord Shiva was very delighted when the deity of the mountain said that he would make Omkareshwar one of his homes and that's why the place is dedicated to Lord Shiva. Over and above, the entire area of this holy place is bordered by mountains, making an enchanting view for travellers. If you're here you must take a Parikrama around the island as it is considered to be very religious and you'll feel relax and peace a here. So, come and enjoy a splendid time vacationing in this must see destination of Madhya Pradesh and explore the serene town of Omkareshwar. When the Mughal emperor and Mahmud Gazni attacked several Hindu temples in the 11th century, Omkareshwar temple was one of them but it luckily stay alive in the attack and later it became one of the most popular holy places for Hindu pilgrims. Pay a visit to the Omkareshwar Temple, one of the famous holy places in the whole of India which is situated on the Mandhata Island and at the meeting point of Narmada and Kaveri Rivers. You'll get charmed by the stunning architecture and striking mural paintings & carvings of the place. Head towards the left from Shri Omkar Mandhata and walk up 287 steps to the 11th century temple of Gaudi Somnath from where you can go down the hill to the northern part of the island. Else, you can go up the narrow, inner staircase of the temple or sit and encounter the play of langur and monkeys. Don't miss to explore the elegant sculpted Siddhanatha Temple in Omkareshwar, which is embellished with wonderful elephant carvings around its base. Savor the delicious breakfasts, yummy lassis and scrumptious fruit salads at pocket-sized café in Getti Chowk in budget or get into the Om Shiv Restaurant that whomps up delightful dishes including a thali. Other notable shrines of Omkareshwar include Mamaleshwar temple, Satmatrika temples, Ranmukteshwar temple, Gauri Somnath temple, Kedareshwar temple, and many more. Omkareshwar has plenty of budget accommodation options ranging from luxury resorts to budget hotels. All the hotels are well furnished and laced with modern amenities. The events and festivals at Omkareshwar are celebrated with great pleasure. The festivals of this place are very colourful and their gala ooze out a sense and feeling of integrity and brotherhood. Mahashivratri: It's a popular festival which is considered as the night of Lord Shiva. According to Hindu calendar, it is celebrated in the month of February- March. During this festival, devotes are found practicing Yoga and Meditation during the night. Not only this, fast are also kept by the devotees and the deity of Lord Shiva is being offered with milk and other articles during the festivities. Ganesh Chaturthi: This festival is held in the months of August- September and celebrated with great pomp. Anant Chaudas: This festival is held in the month of September in which the major processions are taken out on the celebration night and huge idols of Lord Ganesha are absorbed in water. Other festivals of Omkareshwar are Holi and Diwali which are also celebrated here. By Air: The nearest domestic airdrome is Devi Ahilyabai Holkar Airport in Indore which takes around 2 hours 21 minutes drive to reach Omkareshwar. Other nearest international airdrome is Raja Bhoj Airport in Bhopal which is located at the distance of approx 264 km from Omkareshwar. Many flights to various national and international destinations take off from this international airport. By Rail: Omkareshwar Railway Station (Approx 12 km) is the nearest railhead from the city, which is located on the major Ratlam-Khandwa railway line. It is linked with major cities of India like New Delhi, Bangalore, Mysore, Lucknow,, Kanyakumari, Puri, Jaipur, Ratlam, etc. By Road: There are several state government and private buses that connects Omkareshwar to major cities like Khnadwa (73 km), Indore (86 Km), Dewas (114 Km), Ujjain (133 Km), Jalgaon (222 Km), Bhopal (268 Km), Vadodara (376 km), Nagpur (446 Km), and Mumbai (576 km).